There have been a profusion of cute little notes and things on Facebook recently about how different kids’ lives were back in “our day”. It recalls a bygone era when kids rode their bikes to their friends houses, climbed trees, stayed out til dark. Kids were smacked when they were naughty, didn’t answer back or swear, they knew their place. It sounds like a lovely place and time, but it doesn’t ring true for me. The 1970s, as I remember it, involved adults being able to beat children without fear of consequence, children being abused behind closed doors and nobody talked about it, women being bullied by their husbands and having nowhere to go for help. Children had no rights – they couldn’t answer back, or speak out. Women were not the equals of men in the workplace or at home. I am glad I don’t live in that world anymore. And I am VERY happy that my children have had a different life than the one I had. Yes the world has changed. The world has been changing as long as humans have existed. This time is not like the time you grew up in, and children have different experiences than the ones you had. It doesn’t make yours better or more valid than theirs. But some things never change. 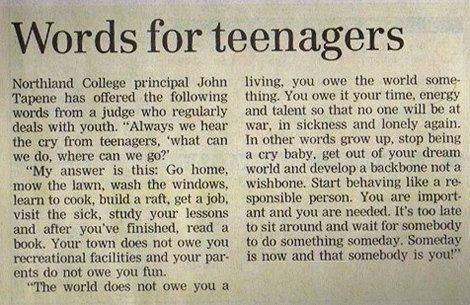 If I want my children to be socially responsible, thoughtful, well mannered, it’s still my job teach them how. The amount of TV they watch, the music they listen to, the games they play have less influence on them than people think. I am still the biggest shaper of my children’s lives – I still have the most influence over what they think and how they see the world. They watch everything I say and do, and they will copy me. If I want my children to spend less time in the cyberworld, then it’s up to me to turn the computer off and go play with them. Or maybe join them in cyberworld and enjoy the marvels of the wide world out there with them. Don’t worry, one day they’ll be lamenting about ‘kids these days’ and recalling that golden age of smartphones and iPads and goodness knows what else! First written by Judge Phillip B. Gilliam in the US in 1959, it was recently reproduced by a Northland high school principal. It’s just as true now as it was then. And for parents as much as for the kids. Always we hear the plaintive cry of the teen-ager. What can we do?…Were can we go?